How's everybody? Feelin' good? I know I get a good feeling sometimes. Why? Because I am Gir Todafunk, Mr. 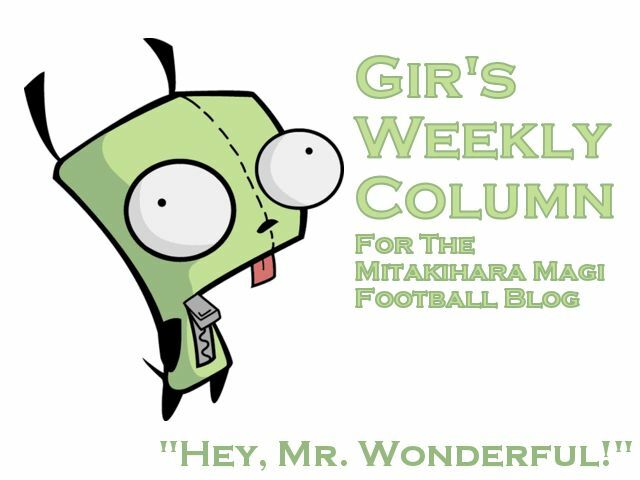 Wonderful, here with another Weekly Column for the Daily Magi. Three weeks to go until football season here in Canada. A few of the schools in CIS-SIC, i.e. the Lavals, UBCs and Westerns of this world, will start a few days ahead of us. But we'll be following close behind. I want to continue from where I left off regarding zone coverage packages in our Morning Rescue set. The Cornerbacks Crew, as you know, play a major role in stopping the pass and making plays, so here we go. The cover 1 defense has just one defender playing in a deep zone downfield. Normally the one defender playing the deep zone downfield is the Safety. The corner's primary responsibility is to play on or off the receiver, and not let him release vertically. Often defensive coordinators will not use Cover 1 unless the cornerbacks for that team are very good at man-to-man coverage. The cover 1 defense is normally only used when offenses are just trying to gain a short amount of yards. An aggressive defense, Cover 1 is employed because it provides for a safety net over the top, but gives the other safety the freedom to rush the line of scrimmage or drop back into coverage. The Cover 2 is popular among defensive coordinators in the National Football League because it implements two safeties to defend the deep routes instead of one. This coverage allows the safeties to watch the play develop in front of them thus allowing the corners to pursue a more aggressive style of play. Cover 2 is a "2 Deep Zone" that uses four defensive backs. Two safeties line up deep, around 11–15 yards off the line of scrimmage (usually each safety stands on or a few feet from his hash mark), while the cornerbacks line up around five yards from the wide receivers which are nearest to each sideline. In Cover 2, the cornerback is usually responsible for "containment". This is where he does not allow anyone to run outside of him (between him and the sideline). He then funnels or jams receivers towards the middle and within five yards, reads the quarterback, and finally drops back to defend the void if there is not a throw to the flat or a running play. This is also known as the "Catch and Run Technique". Typically with the Cover 2, cornerbacks mirror each other's zone responsibilities. However, sometimes they play a "man-up" style bump and run, a form of bump and run designed to eliminate the short pass, where the receiver is forced to the near sideline, which is the opposite of the run oriented "containment" style of Cover 2. Usually if one corner is in man to man coverage, the other is in man to man coverage as well. The two safeties act as a security blanket for deep routes. So that's zone coverage in a nutshell. Next week, I talk a little bit about jamming the receiver and single/man-to-man coverage. Till next week, I am Gir Todafunk, signing off. You are not alone.